I usually buy coffee pre-ground, which no doubt coffee purists will tell me is a terrible thing, but frankly life is too short to be messing about grinding coffee myself. There are, of course, exceptions to every rule. If an interesting coffee is only available in bean form, or if I need it to last a little longer in the cupboard than usual, then I’ll happily get beans. The other exception is when I need the coffee varying grinds, which is the case here. For my Aeropress, I generally grind beans as fine as my little grinder will go but I bought this coffee to go into my Coffee Porter (which is still in the fermenter, so you’ll have to wait for that review) and therefore needed it to be coarsely crushed. 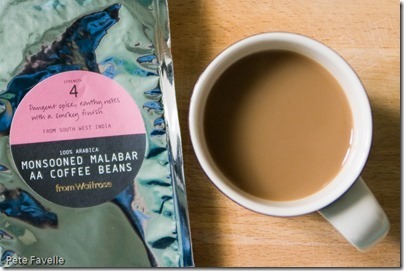 My local Waitrose tends not to do coffee in a “brewing-ground” form, so that’s when I have to buy beans. And the range of coffee in bean form is quite badly limited. 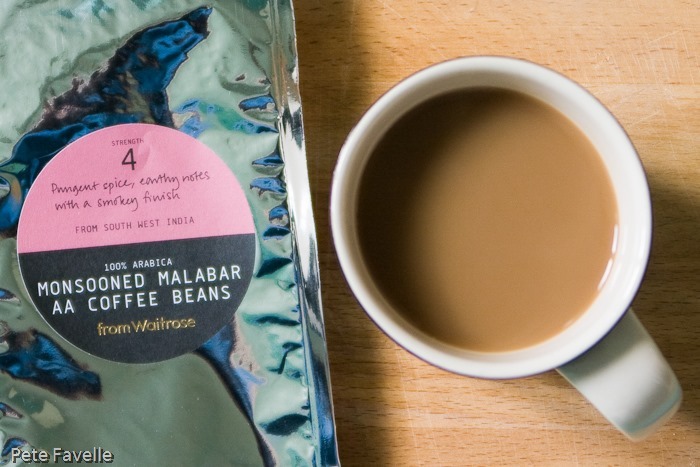 This is their own label Monsooned Malabar AA Coffee Beans – the Malabar in this case being the Kerala coast of India, rather than the towns in Australia, Indonesia or Florida! The grounds have the richness I’ve grown to expect from Malabar – a sweetness of dark, dried fruit blending with a hint of cinnamon bark and aged, musty wood. Unusually, brewed the aromas remain almost the same; rich, slightly spiced wood and a definite dark sweetness. In the mouth, the sweetness has been lost leaving a rich bodied coffee with an understated dried fruit character, a touch of old wood and a nicely gentle tannic finish – there’s a little bitterness, but it’s subtle. Overall, it’s a flavoursome coffee that isn’t aggressively strong which makes it very drinkable and deserving of four stars.